don't think i've ever seen one in action before! Get out!! That is SOOOO cool. Fav! And timber!!!! Wow! Neither have I! Very cool! Super capture - bet that tree did not last long. Oh, My! Lots around here, I've never caught one in action! Awesome! That being said, this is an awesome nature shot! How neat to catch him in action cutting down a tree! I'm going to have to Fav this! Fav! What an amazing thing to see! They are usually so nervous of people aren't they! Super to see one in action - I wonder if they get splinters in their teeth! Don't ever think I have seen one of these guys, either! In cartoons, maybe.... How long does it take them to bring a tree down? And, then, what? What a great capture! And, yes, it's quite a departure for you! Wow what a fantastic capture!! To see a beaver and actually catch him in action - brilliant!! Huge Fav! Wow, awesome find and capture. It's about to fall. Wow! What a photo opportunity! I'm thrilled if I see a beaver dam. I'd be shaking with excitement over spotting one in action like this. Great job capturing the hard-work rodent. that would be intense having to chew through that! Fav. That is so cool. We have one over at Beckley Park but I have never seen him. Just the chopped down trees. Great shot. Only seen that on TV before. This is amazing. Timing is everything! wow. thats amazing. great capture! Fantastic - can almost feel the chips flying! What a fabulous shot. I definitely have not. Great shot! He must be desperate! How lucky to see this! How exciting to see this. OMG!! Talk about being in the right place at the right time. Instant FAV from me! ... and so close! What lens were you using? Saw this on the trending page and had to comment -- A wonderful nature shot , Fabulous and a fav ! Special, not just the shot but the experience. He almost is looking at you like "Opps, I forgot to pay attention." @sueb47 hi Sue... i was using a 16-55... this was taken at about 45mm i think... it's cropped in a bit, but not hugely... i was able to get quite close to him... maybe 6 -10 feet away? This image made me smile this morning :) thank you! Wow, what an encounter. This is beyond cool. This is an amazing shot. Where I live, in Oregon (the Beaver state), everything is named Beaver this and beaver that. I have never seen one, and nobody I know has ever seen one either as they are threatened by habitat loss. Fantastic shot! Wow, caught him in the act. Great shot! Wow, so lucky for you to spot this! Fave! 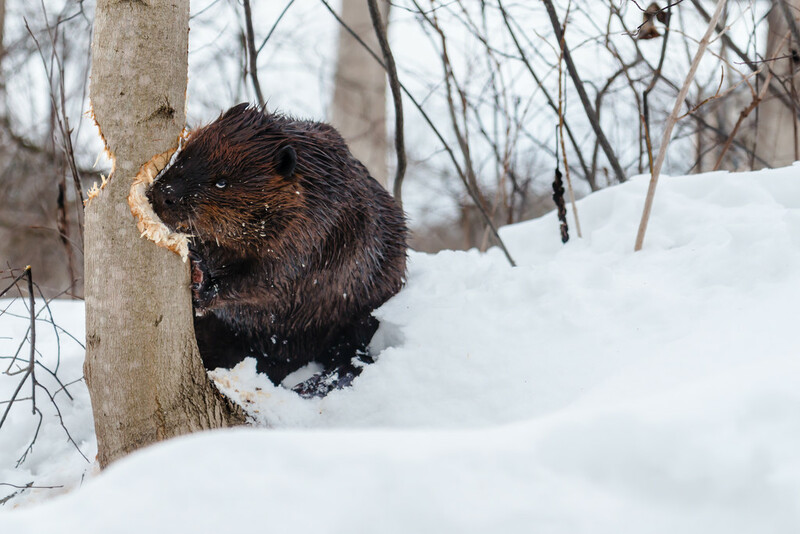 Just seeing this now... wonderful Canadian gnawing in action! I am laughing at some of the comments, too. :) Nice shot. wow. what luck - he looks so busy!! that tree is history! Wow. I have only seen the results-never the chewing. WOW! Well done! Hope you didn't have to wait too long! Fav! Awesome shot to see on the PP! Congratulations! love the title! Whoa, this is an amazing photo! You can only have blind luck like this when you have your camera at hand. Fav! I did a double take too, as this is so not what you normally do. Wonderful capture of this beast in full action - and they way he is looking at you is incredible! Fav. OMG!!!! Great capture and FIND!!! You lucky thing seeing this sight! Congrats on the TT!!! Heehee!!! Love your title!!! And congrats on TT! this is awesome - wow! I missed this! Congrats on TT, what a great shot! Imagine the damage they could do to your leg, haha. @radiogirl yep! Along the Humber river coming from James Gardens... Tx! Hilarious and wow for the great wild animal capture. That is amazing. Congrats on the TT, sorry I missed this earlier. My job and family sometimes get in the way of my 365 project. :) Glad this made the TT so I could see it!! This is incredible! Huge (and belated) fav and congrats!!!!! Congratulations Northy on another TT finish! Well deserved! I can't believe that you got this close to a beaver! Awesome. I've only seen one swimming.